Sticky Labels Blog | Business Labels | Sticky Labels Has A New Home Page! 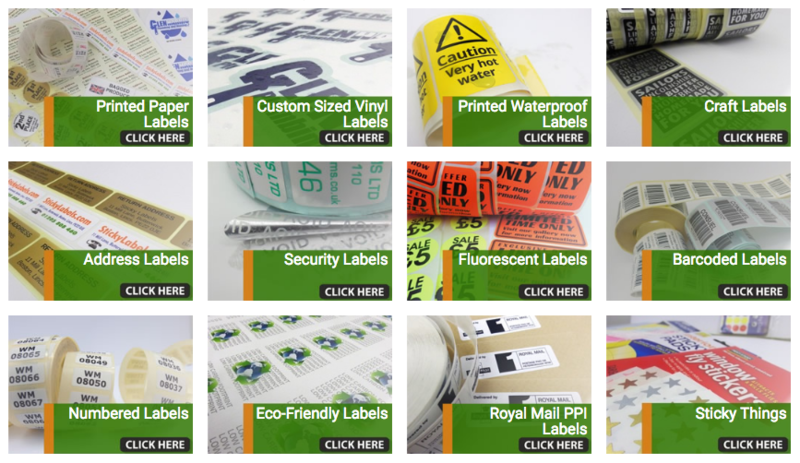 Here at Sticky Labels, we’re constantly trying to improve our service to you and make ordering printed labels even easier. You may have noticed we had a brand new website back in October and we are still working on making it better, sleeker and more user-friendly! We include postage and VAT in the prices shown to avoid nasty surprises at the checkout and now we’ve overhauled the look of the home page to make sure you find the right labels you require: Quickly. We’ve made the ‘Printed Labels’ icon (for creating custom stickers we print) and the ‘A4 Inkjet and Laser Labels’ (for blank labels you can print yourself) buttons much more prominent so you can quickly and easily find what you need and go straight to the label builder or the A4 inkjet page. This may save a few clicks! You may notice that on the bottom right we have an all-new chat feature. If you have a question you can let us know instantly (Within working hours) or leave your details so we can get back to you. It’s much easier than picking up the phone and should mean we can answer any little questions you have or help if you are stuck in the design process. 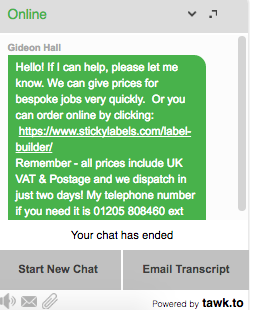 All you need to do is click on the ‘Let’s Talk’ icon to expand the chat and ask away! We’ll even automatically ask you if you need any help provided we can see you’ve been with us for a while and may be stuck! We’re always trying to think of ways to make it easier for you to create custom stickers and we’re hoping the new home page helps. But we welcome your opinions and feedback, so feel free to drop us a message and let us know! You can use the contact form or email us using the address at the bottom of the page and tell us what you love (hopefully!) or don’t like (boo!) about the new design. It’s always good to hear back from our lovely clients!